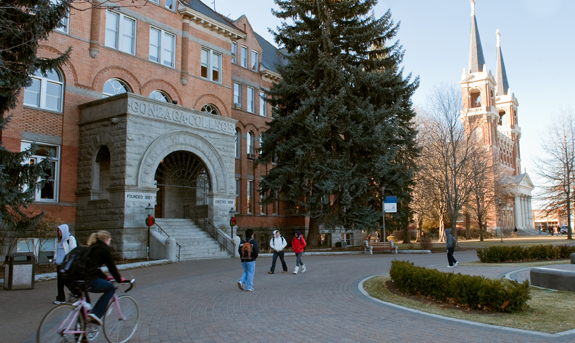 Professor: Will Gonzaga also consider removing the Society of Jesus from campus? Gonzaga University in Spokane, Washington, is home to the Faith and Reason Institute, which will be hosting talks on September 13-14, 2018, by Robert Royal and Archbishop Charles Chaput on John Paul II's encyclical "Fides et Ratio", which was released twenty years ago. Dr. Eric Cunningham, Associate Professor in the Department of History at Gonzaga University (GU) and a former advisor to the campus council of the Knights of Columbus at GU, yesterday sent a letter to Sue Weitz, Vice President for Student Life, remarking upon her letter explaining that a Knights of Columbus group’s application to be recognized as an official student organization had been denied by GU. The Knights of Columbus, by their very nature, is a men’s organization in which only Catholics may participate via membership. These criteria are inconsistent with the policy and practice of student organization recognition at Gonzaga University, as well as the University’s commitment to non-discrimination based on certain characteristics, one of which is religion. The chief reason for my confusion is that as an organization, the Knights of Columbus is, by these criteria, identical to the Society of Jesus. How strange it is to think that if Ignatius of Loyola and his companions, who were students at the University of Paris when they established the Society, had tried to apply for club status at Gonzaga, they would have been denied. I can’t help but wonder if it is the intention of the Office of Student Life to dissociate itself from Gonzaga University because of the Jesuits’ long-standing practice of such “discrimination,” or will Student Life instead choose to initiate action to remove the Society of Jesus from its affiliation with the Gonzaga community? This may strike you as an absurd inquiry, but it is actually a logical response to the rationale in your decision. As you noted, the revival of the Catholic Daughters on campus would solve the “gender-exclusivity” problem, but alas, the Catholic Daughters are Catholic too, and that seems to be central problem. It would appear that the Knights of Columbus have been denied recognition as a club on this Catholic campus specifically because it is a Catholic group. Is that not the only conclusion one might draw? As CWR has previously noted, Gonzaga has released a statement about the Knights of Columbus controversy, saying that President Thayne McCulloh will be reviewing the Student Life division’s decision. Regardless, Dr. Cunningham’s question highlights the illogical nature of Weitz’s decision and points to what appears to be the real issue at hand: that the Knights of Columbus are committed to upholding Church teaching and practicing the Catholic Faith.